June 20, 2007 By Tim Mccord & filed under All Articles, Long Guns, Other Tactics & Training, Tactics/Training. 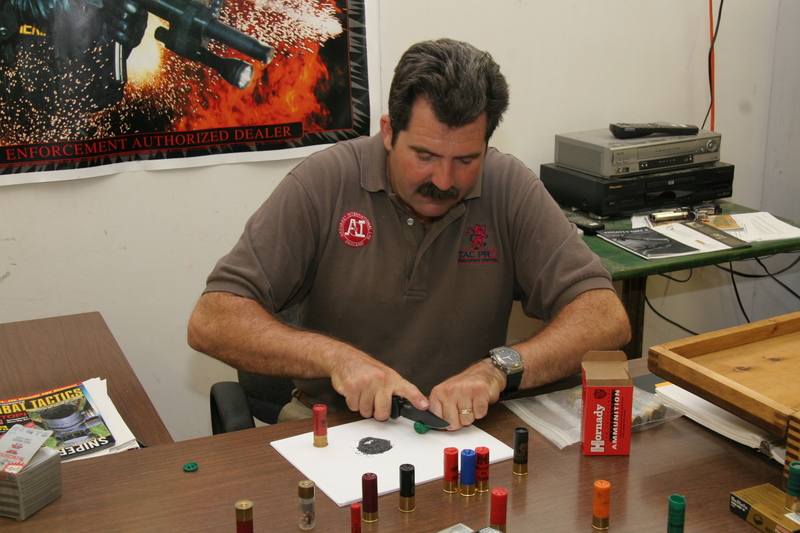 Bill Davison dissecting various shot shells to demonstrate the technology they contain. Bill Davison’s calls to “feed the puppy,” along with the deep booms of a 12-gauge shotgun and lead striking steel, make up the distinctive sounds of the jungle run during the Primary Shotgun Class at Tac Pro Shooting Center. The “puppy” that Bill is referring to is an imaginary 300-pound Rottweiler on a deceptively long leash—which is how he thinks of the combat shotgun. Within the length of its leash, a ferocious oversized Rottweiler absolutely owns the area. The effective range of the ammunition selected determines the length of the leash. For my pet Remington 870 12-gauge with a 20-inch, rifle-sighted cylinder bore barrel, the leash was far longer than I imagined. 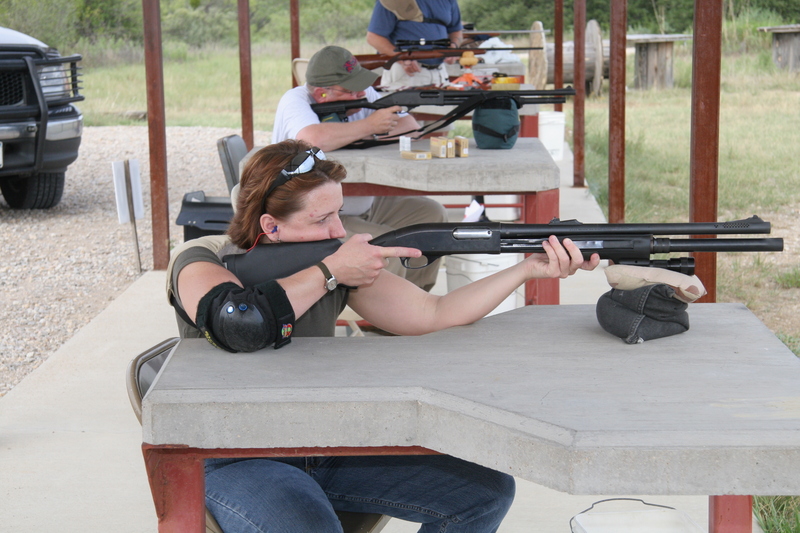 Davison’s course is designed to educate and to explore the capabilities of your chosen shotgun. No other weapon is more versatile as a result of ammunition selection than the shotgun. No other weapon system is more misunderstood. Meticulously patterning a variety of loads is mandatory for identifying the most effective ammunition for your particular shotgun. For those unfamiliar with the school, Tac Pro Shooting Center is located just an hour and 15 minutes west of Dallas-Fort Worth International Airport. 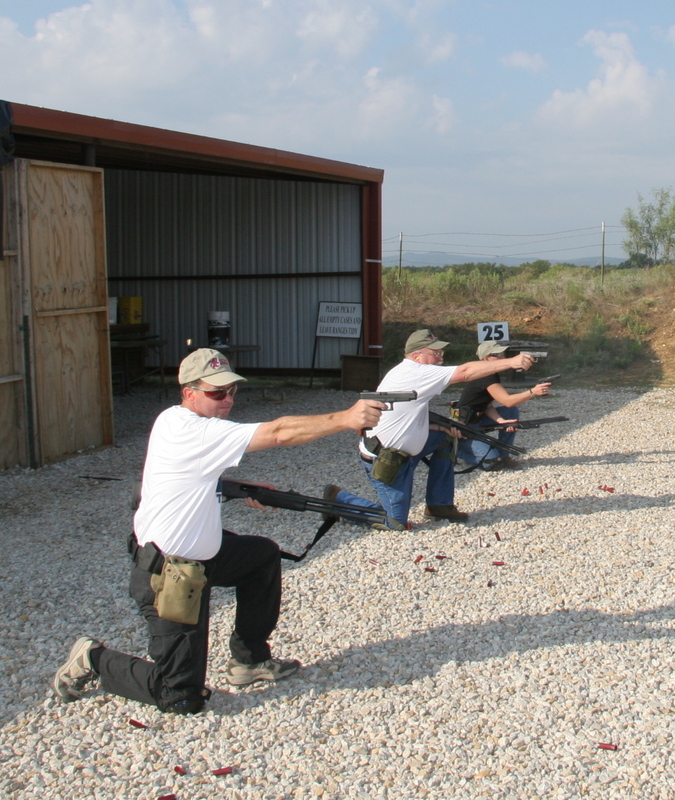 The facility includes a complete pro shop, classroom with attached 30-yard training range, two 50-yard tactical bays, 100- and 200-yard covered rifle ranges, a 300-yard “jungle run” and one of the few 1,000-yard ranges in north Texas. Bill Davison, chief instructor, has 25 years of operational arms experience, including deployments with British Special Forces, protecting high risk VIPs in the Middle East and private security operations. 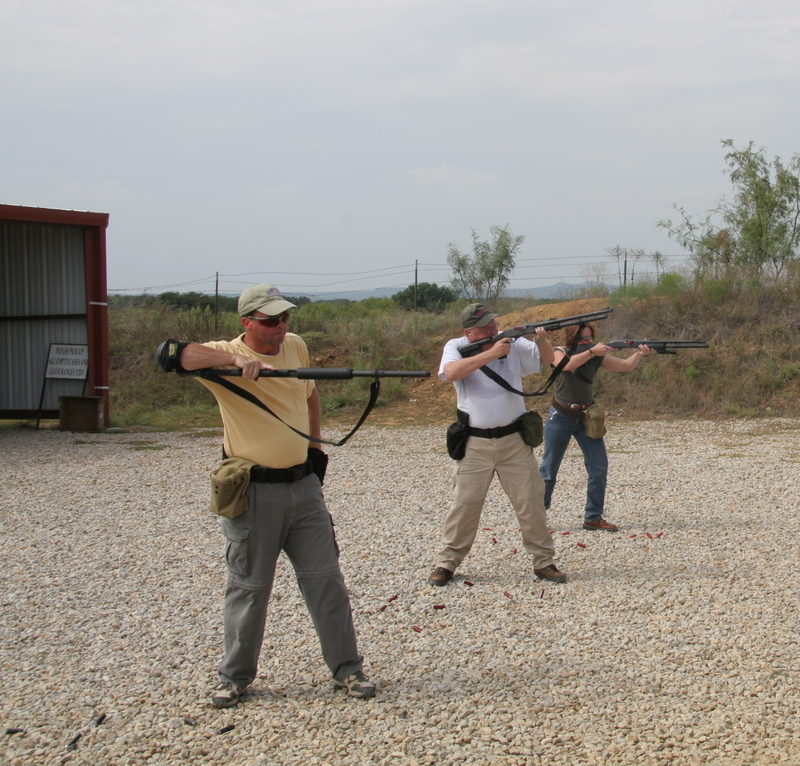 Tac Pro offers group classes and private firearms training in pistol, shotgun, carbine and precision rifle. Bill’s lovely wife Alice greets everyone and makes them feel welcome. She also ensures that everything and everyone are where they need to be, when they need to be there. The first of the three days of training was extremely enlightening. Bill loves to debunk myths and there are more myths surrounding the shotgun than any other weapon system. In some cases the myths about the shotgun are so heinous that they could be fatal to the misinformed. “You can’t miss with a shotgun. Just point it in the general direction and you will hit your intended target,” is almost universally accepted as fact and I fear for the novice who may take that information to heart. Hornady’s TAP Low Recoil OO Buckshot provided very tight patterns from most of the shotguns tested. Bill covered the history of the modern combat shotgun, taking us back to the trenches of World War I France. The trench broom or sweeper, as the Winchester 1897 pump 12-gauge became known, was hated and feared by the Germans. Seen as ungentlemanly due to the horrific wounds it caused, Germans regularly hung captured shotgun-armed Americans as a warning to all who followed. Operating in two-man teams, one man shooting while the other loaded and covered the rear, the combat shotgun was highly effective at rolling up enemy trenches. It was in the trenches where shot shells began to evolve from paper hulls to brass to insure ignition in wet conditions. The 1897 Winchester pump was so effective that it saw service in every American theater of war up to and including Vietnam. The Remington 870 has become the stereotypical policeman’s shotgun, although many 1897s and other brands still find a place in police armories. Vang Comp-equipped 870 proved extremely effective at tightening patterns of wide variety of buckshot loads. It was also the accuracy champ with slugs. We spent a fascinating classroom session dissecting various modern shotgun shells to learn why they work the way they do. From inexpensive field load #8s to Hornady TAP Low Recoil buckshot and slugs, the technology applied to shotgun ammunition is evolving at a rapid rate. Just a few years ago, a 12-inch pattern at 15 yards with 00 buckshot was considered good, unless you were the lucky owner of a Vang Comp modified shotgun. Today with Hornady or Remington Law Enforcement Low Recoil 00 buckshot, you can get that same 12-inch pattern out to 30 yards or beyond with most any off-the-shelf shotgun. This doubles the effective range of 00 buckshot. Each shotgun is different and part of the class was spent meticulously patterning a variety of loads in each student’s shotgun. We learned why the shotgun is so effective as a man stopper. 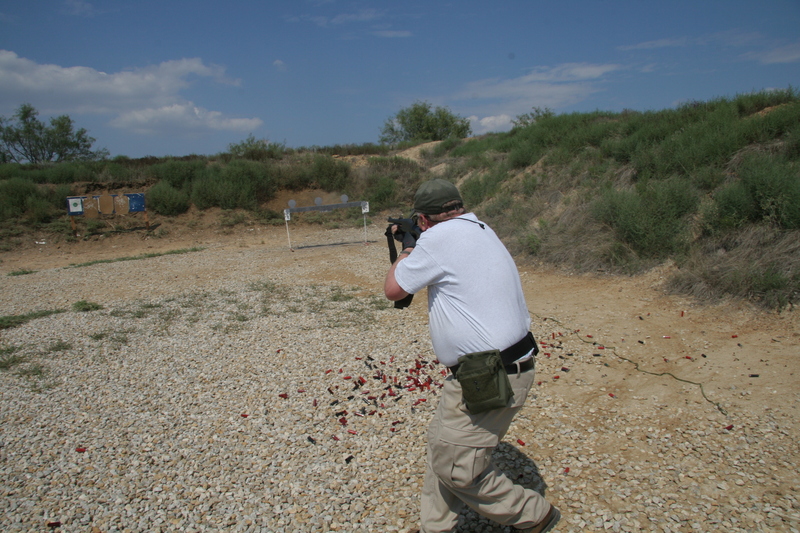 During Bill’s Primary Pistol class we were taught to shoot triples—three shots in rapid succession into the cardio-vascular triangle (CVT)—to create such extreme trauma to the nervous system that the body simply shuts down, effectively ending the fight. A load of eight 32-caliber balls (00 buckshot) traveling at 1,400 feet-per-second (fps) striking the CVT simultaneously is nothing short of devastating. Load one, shoot one is tremendously useful means of keeping the shotgun in the fight. Notice shooter’s focus remains on target through loading process. For home defense, at across the room distances (less than 20 feet), Bill recommends #4 buckshot. This load is often used by professional hunters in Africa to deal with wounded leopards. It is also much less likely to over-penetrate into adjoining rooms. After patterning and documenting the performance of various loads in our shotguns, we had the opportunity to try a number of different types of shotguns. Semi-auto shotguns by Benelli and Remington are very popular among three-gun competitors and are beginning to make inroads into military and police agencies. Although these were fun (and very fast) to shoot, all of the students trained with their own shotguns. We ended the day with basic loading techniques and learning to deal with stoppages. Shooting effectively on the move requires solid technique and a lot of practice. Slugs add immeasurably to the versatility of the shotgun, as we would find out first-hand during the second day of training. We started on the 100-yard range to sight in with slugs. We were all pleasantly surprised by how easy it is to make effective hits at that distance. We also shot our favorite 00 buckshot load at 100 yards. Every one of us registered multiple hits in the CVT with 00 buck at that distance. 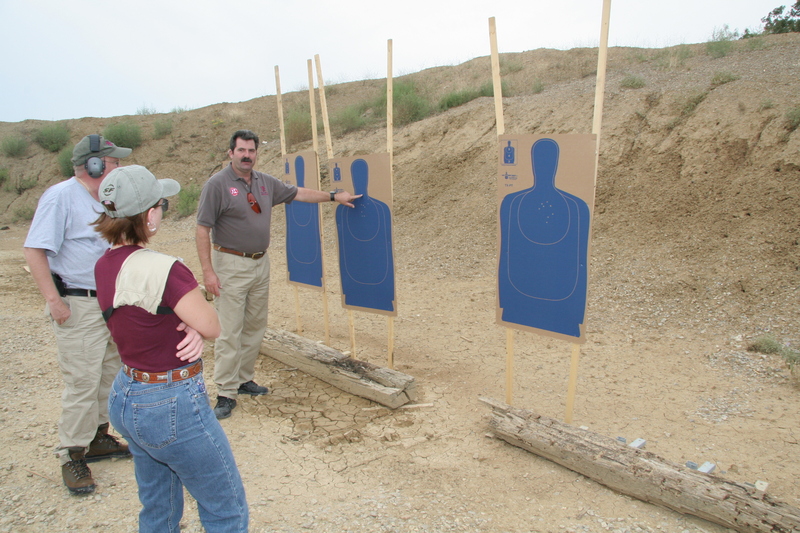 When Bill had us put up targets at 200 yards, the class exchanged skeptical glances. We should have known better. Not only did we make effective hits on silhouettes at 200 yards, Davison soon had us ringing steel targets out to 300 yards. 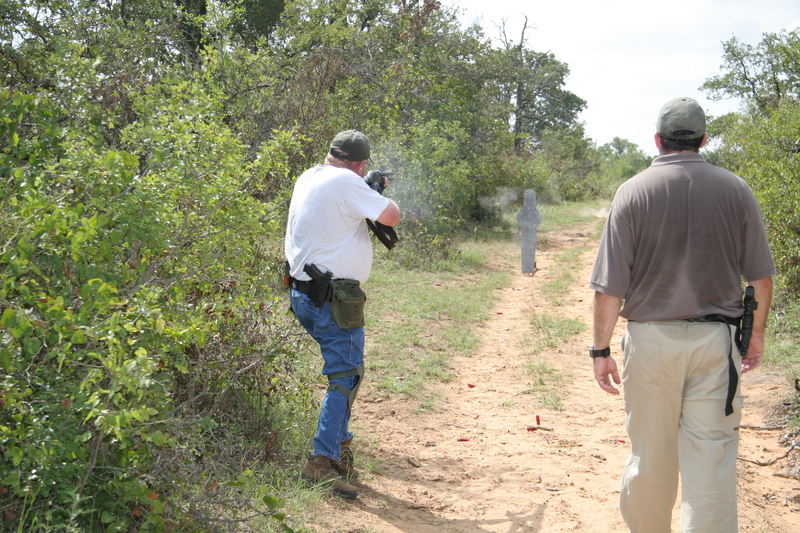 Immediate action drill with the shotgun requires rapid transition to the handgun to continue fire while seeking cover from which to sort out the stoppage and get the shotgun back in the fight. We observed several slugs that penetrated two-by-fours at 200 yards and were recovered after penetrating another eight to 12 inches in the berm beyond. As Bill says, “Once that slug is moving, it just does not want to stop.” That is why 12-gauge slugs are so often carried in big bear country, where penetration is paramount. They are also highly effective against automobiles, often passing completely through them end to end. Bill warns against use of slugs use in populated areas. Feeding the puppy is a combination of finesse and physicality that I personally had never experienced until this class. 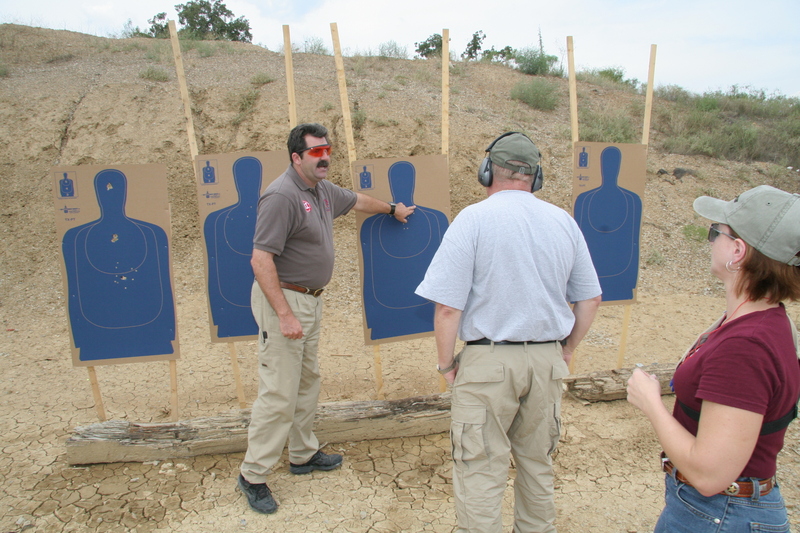 Drills such as “load one, shoot one,” strong hand feed on the move, weak hand feed on the move and ammunition transitions require training, concentration and a lot of practice. Using birdshot, we practiced each movement until we could perform it smoothly and without taking our eyes from the target. These drills left our arms and shoulders tired at the end of day one and tired and sore on subsequent days. Davison does a great job balancing classroom and range time to avoid wearing his students out. We were fortunate that our class was conducted during dove season. We traded in our combat shotguns for 20 gauge over and unders to experience yet another area where the shotgun reigns supreme—wing shooting. A few hours in the field netted enough birds for a nice meal and provided indisputable evidence of the shotgun’s versatility. So you can’t miss with a shotgun? B.S.! We learned very quickly shooting at steel plates at ten yards that you absolutely can miss with a shotgun. Using birdshot to engage six nine-plates on the plate rack, the pressure of man-on-man competition often forced us to attempt speed beyond our capabilities to make effective hits. There is no better teacher than experience. A few eyebrows were raised during this exercise. We then competed in the load one, shoot one drill on steel—more fun than should be legal. Finally Bill tied movement in with all of the other primary skills we had been learning. Moving laterally, shooting from the strong and weak sides, and shooting at nine-inch steel plates while feeding the puppy. For a similar experience, try patting your head, rubbing your stomach, and reciting the alphabet backwards all at the same time—but that was nothing compared to the jungle run. Jungle run puts student’s newfound skills to the test. I have attended several of Bill’s classes and I can say without reservation that the jungle run always gets to me. After covering transitions, we spent the remainder of day three on the jungle run. It is 300 yards of jeep trail through the scrub oaks of north central Texas. Positioned diabolically along the trail are eight to ten dull gray Pepper Poppers. Hidden 30 yards back in the shade of the trees or just feet from the trail—concealed until you are right on top of them by an outcrop of undergrowth—Davison takes great pride in challenging the student’s newfound skills. Invigorating and stressful, fun and humbling, the jungle run will cast a brilliant light on what you think you know and how you think you will perform under stress. Each student made three runs. Once with birdshot, which required that we close aggressively on the targets to neutralize them. The second was with buckshot only. “Double O” certainly took down the targets with authority, but placed more of a premium on marksmanship. The final run was with a combination of buckshot and slugs. Sure enough as I rounded the corner to begin my last run, Bill had repositioned the targets including one 75 yards out, right in the middle of the trail. I fired two rounds of 00 to make room for a slug as I moved to cover. The second slug solved the problem and I moved forward with Bill yelling for me to “feed the puppy!” Twenty-odd rounds of 00, two more slugs and half a magazine from my pistol, and all the targets were down. Soaked in sweat, legs and arms feeling like rubber, it was only Bill’s grin and his typically British, “nice exercise” that gave me the energy to smile and collect up my empty hulls. For hunting birds or small game, the shotgun has no rival. For defensive use from point blank out to 40 or so yards, 00 buckshot rules. Slugs are easily effective out to 100 yards and I would not hesitate to engage targets out to 200 yards or beyond if the situation required it. For home defense with limited risk of over penetration, nothing beats a shotgun. The fact that a single weapon can fill all of these roles simply by changing the type of ammunition is amazing. Feed the puppy correctly for the situation and he will take care of business. Bill Davison is just the person to teach you how.